I was introduced to my first true New York bagel when I was about seven or eight by a family friend, who, although not Jewish, had lived in NYC long enough to have earned her New Yorker badge. 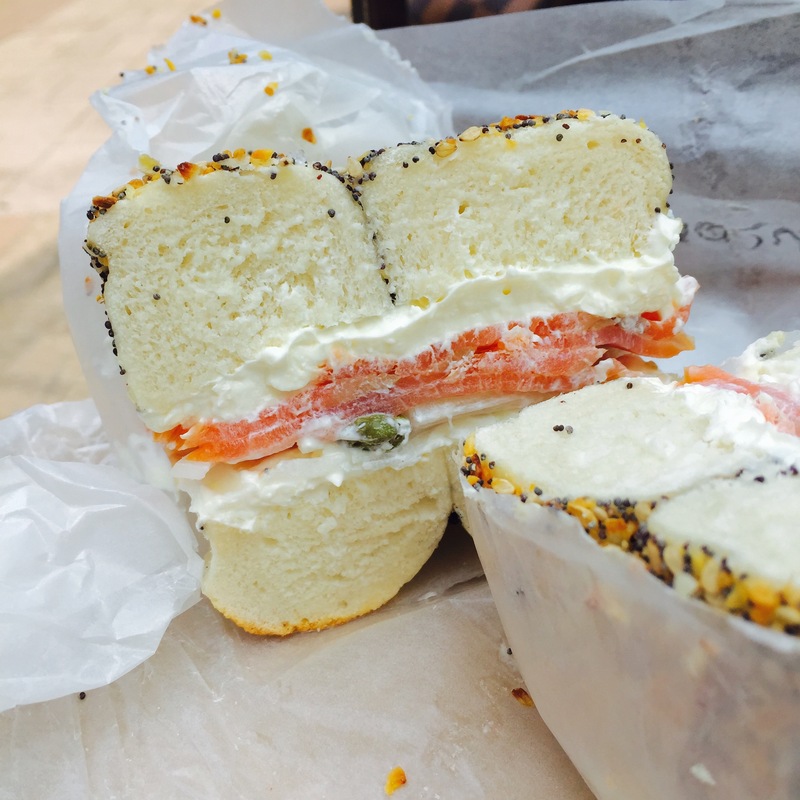 For breakfast one day, she had put together a platter of everything bagels, sliced smoked salmon, cream cheese, dill, chopped red onion, and capers. After helping me assemble one with extra smoked salmon and extra extra cream cheese–two items that typically do not exist in a Chinese household’s refrigerator in those days–I took a bite. And breakfast was never the same again. I am certain that we have “bite memory,” just like we remember tastes and smells from the past. There was something utterly extraordinary about the chewiness of that first bite of bagel, with its supple, boiled skin combined with a dense, toothsome center. Yes folks, gluten. That good chew that gets all your salivary glands going–that’s the stuff of a true bagel. 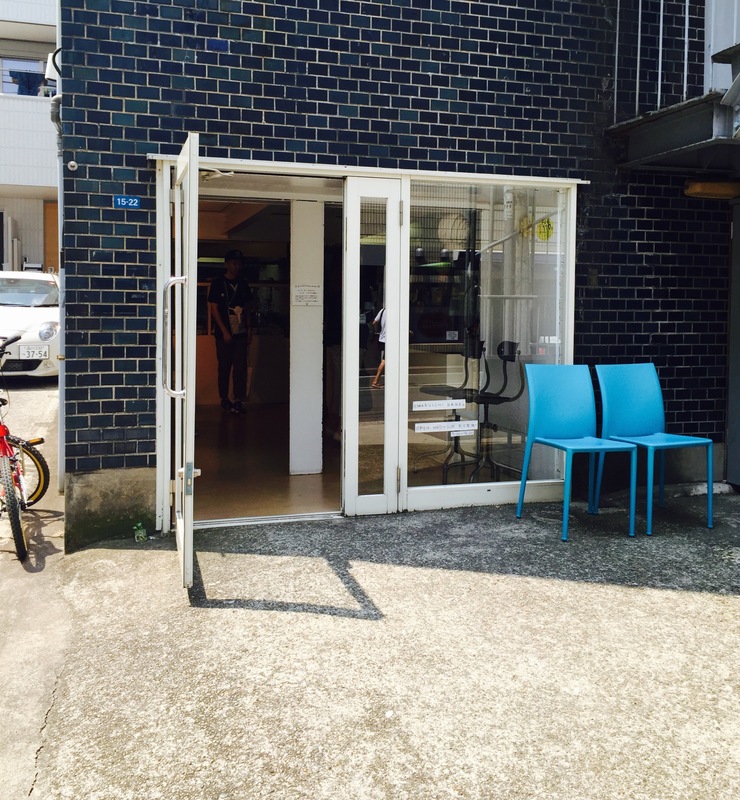 Which, I’ve heard from expats and locals alike here in Tokyo, finding is like searching for unicorns. Japanese bread is outstanding. Much of it is soft, fluffy and sweet. And others, styled after the French method of bread making­–crusty and chewy baguettes–could rival any French boulangerie. However, bagels are rare; most bakeries here don’t sell them. The few that I have tried have such a fine crumb they just fall apart in my mouth. Disappointed, I did some digging around. 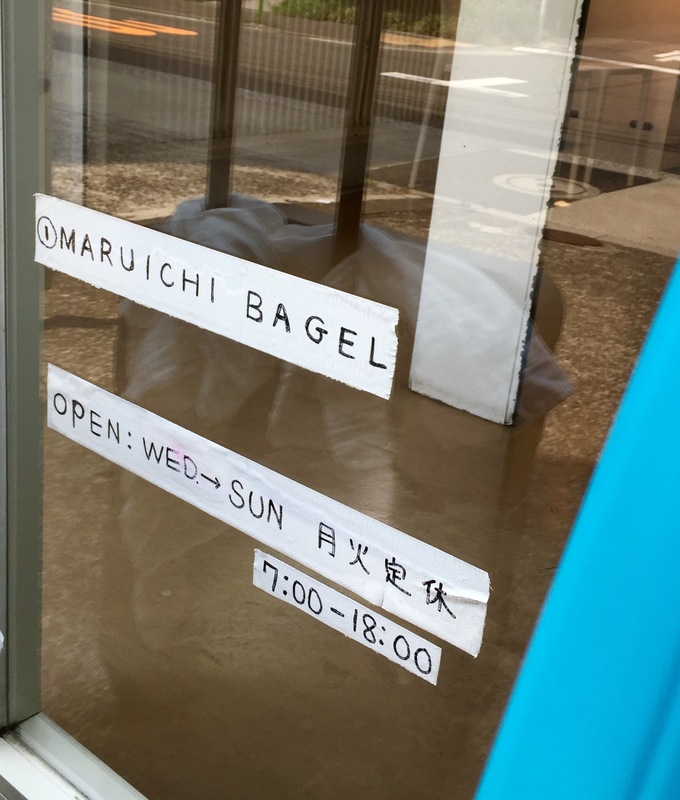 It wasn’t terribly hard to find Maruichi Bagel, a small bagel shop on a quiet residential street of Shirokane. 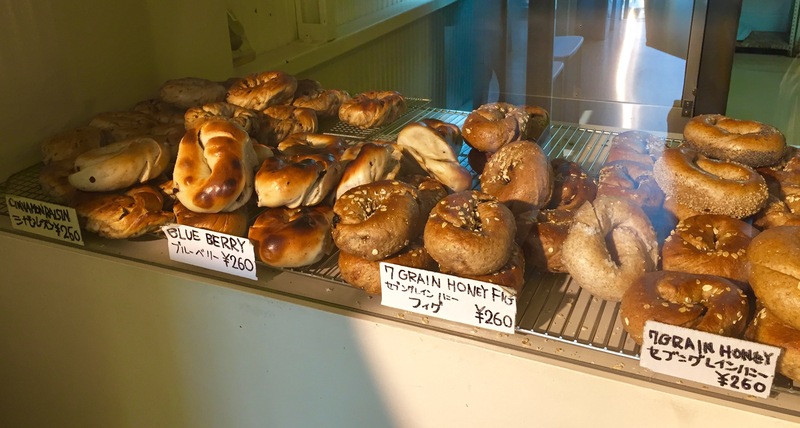 With the exception of Bagel Standard in Nakameguro, this is the only bagel shop in Tokyo making New York style bagels. 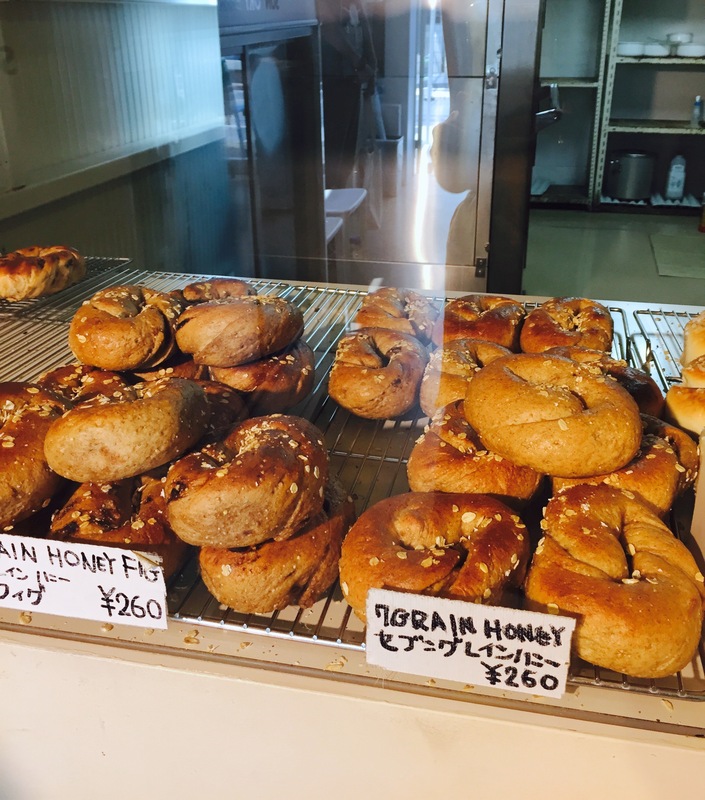 Locals and visitors alike flock here for these “lead donuts.” Maruichi Bagel’s owner, who learned to make bagels at New York’s OG bagel shop Ess-A-Bagel, continues to use the same recipes and techniques now. 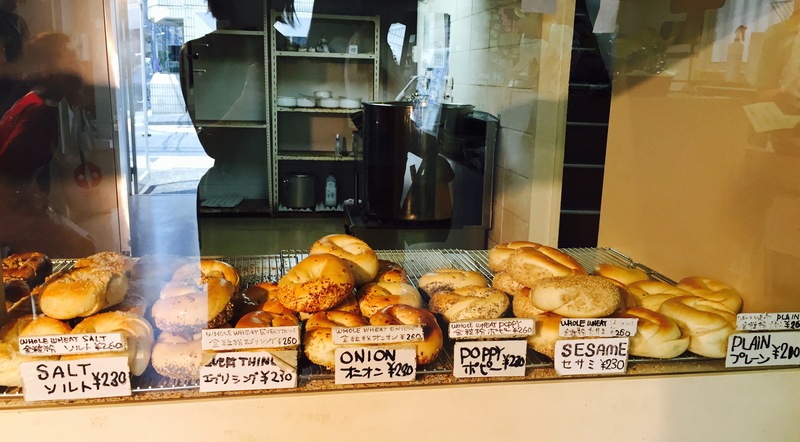 Enter for NY style bagels in Tokyo. Beware: no signage. What’s different of course, is the ingredients are from Japan: the flour (high-gluten bread flour), salt, natural yeast, malt, and water. The result is a bagel that is as close to a New York bagel as you can get in Japan. There are several familiar flavors: plain, sesame, poppyseed, everything, onion, salt, blueberry, and cinnamon raisin. And some unique offerings: 7-grain honey, 7-grain honey and fig, and rice flour. 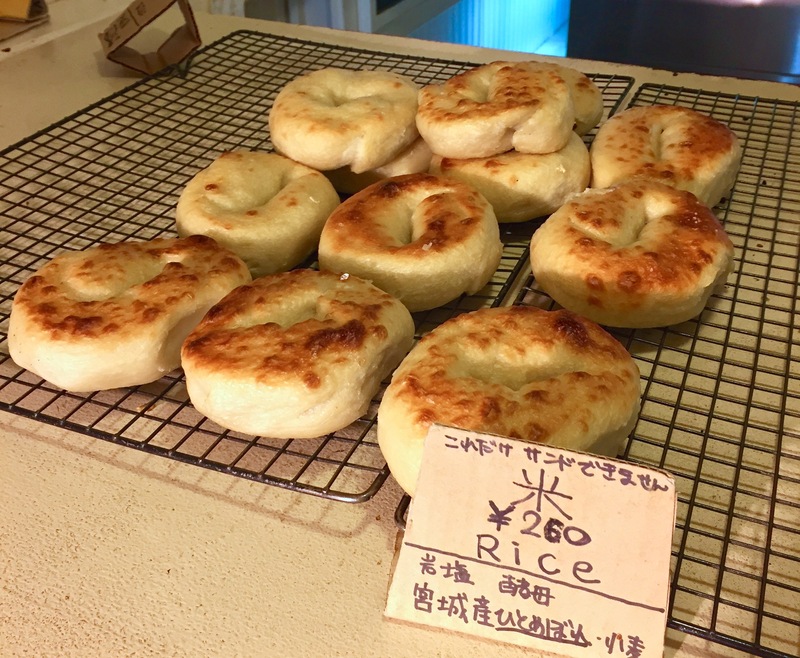 These bagels are made from rice flour. Very very chewy. Spreads and fillings include homemade cream cheese (plain, apple cinnamon, veggie, and sun-dried tomato), honey sesame spread, almond butter, hummus, basil pesto, honey, butter, smoked salmon, prosciutto, pickles, sliced cheese, tomato, lettuce, onion, cucumber, sauerkraut, and homemade salads (egg salad, kabocha pumpkin salad, tuna salad, and potato salad). I was told by the staff that these spreads and fillings are seasonal, and can often change. When you order, you are asked whether you want a “half size” portion or a “regular size” portion of cream cheese and other toppings. The young lady making my bagel showed me what the half size looked like, which was already a very generous amount of cream cheese. There are some specialty sandwiches like a pizza bagel sandwich, veggie sandwich, pickles sandwich, and smoked salmon sandwich. If none of these interest you, you can customize your own bagel sandwich however you like, with as many topping as you like. 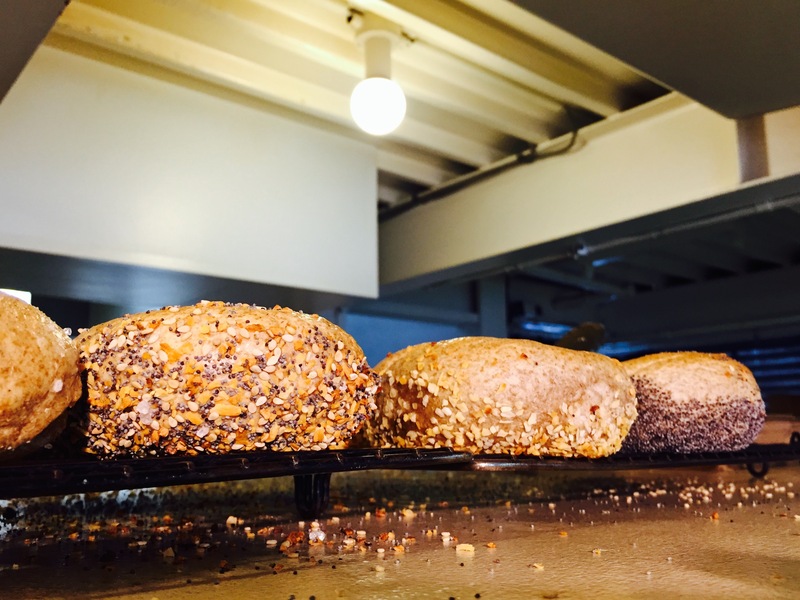 Bagels are sold starting from 7 AM, while bagel sandwiches are available starting from 10 AM. All orders are takeaway only as there is no seating at the shop. However, there’s a small parklet with bench seating just steps from the shop, and a Starbucks a block south, adjacent to the Queen’s Isetan building. Arriving around noon on a Friday, I was met with only a short line of about 4 customers ahead of me. To the glass case, next to the cash register, were stuck handwritten sticky notes with menu items, in both Japanese and English. To the left was another display case, holding all the bagels, and even more sitting on cooling racks on top. Signs are all provided in English. 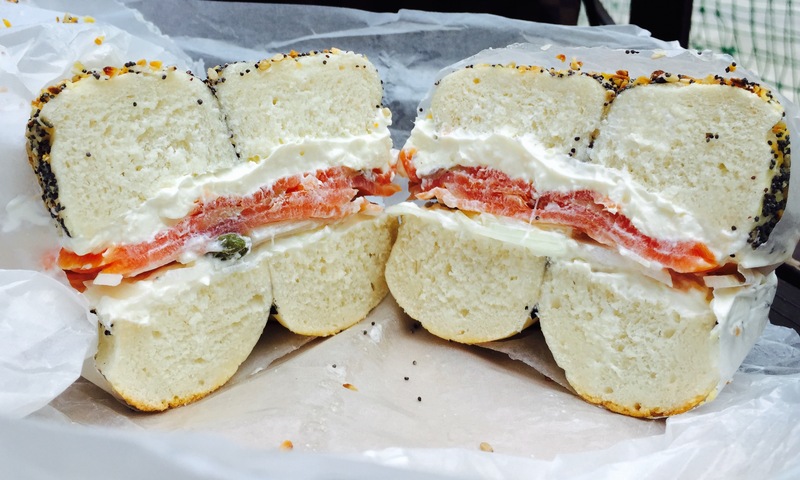 I ordered an everything bagel with plain cream cheese, smoked salmon, onions, and capers. 10 minutes later, I received a hefty package, wrapped neatly in wax paper, wrapped again in a brown paper bag, and then, one final time in a plastic bag with packet of Sicilian rock salt thrown in. Happily, I handed over ¥1010 (about $8.15). As for the bagel, it was legit. One side, coated with a generous layer of poppy seeds, sesame, rock salt, garlic, and onion, was chewy with a slight crunch, while the other side was thick, shiny, and golden–the trademarks of a good boiled bagel. The inside was dense and satisfyingly chewy. This, combined with the creamy, slightly tangy cream cheese and salty smoked salmon made for a fantastic bite that put any nostalgia for the real thing to rest. Some slight differences (from the real deal) to note, however, were the thickness of the bagel, which made biting into this monster a jaw-unlocking feat. Maruichi also uses shaved white onions rather than chopped red onion–more common in U.S. bagel shops. These particular onions however, were sweet and crunchy, with none of that raw oniony spiciness. Yet another palpable difference is the service here: none of the “charming” attitude New Yorkers are so well known for. 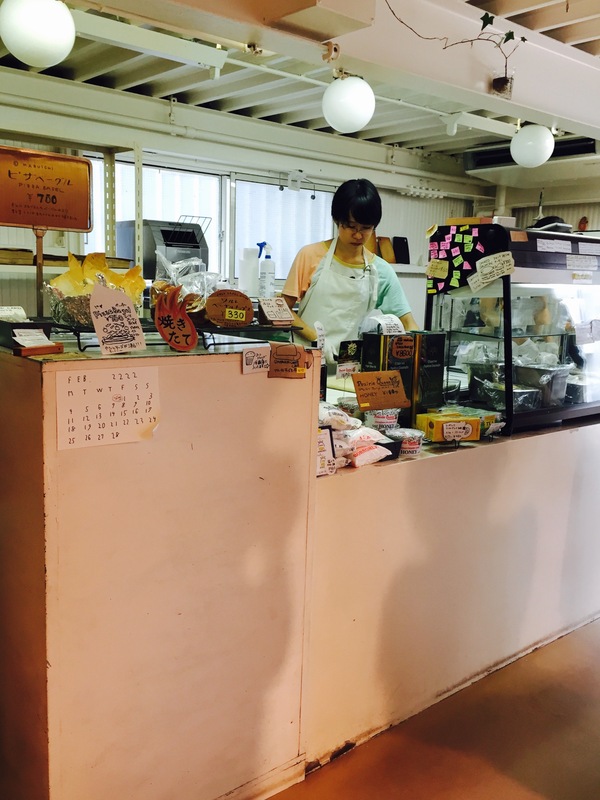 There were four ladies working and chatting softly behind the counter, taking orders, making sandwiches, checking the ovens, and working the register. One greeted me in line to take my order. She very pleasantly showed me the bagel selections in the case and the explained the toppings. So, would I come back? Hell yes. And next time, an everything bagel with Maruichi’s house egg salad on one half, and pumpkin salad on the other half sounds just right. Not to mention, a dozen or so assorted to take home. I’m amazed, I wouldn’t have expected the Japanese to be able (and willing) to make such nice and fluffy breads. Interesting post, thanks for sharing! Are you baking bagels yourself? Superior thinking deemnstratod above. Thanks! I meant that I didn’t think bread was part of the food culture in Japan, did not mean to offend anyone here, sorry for that. Hi there! Thanks, and no, I don’t make bagels myself. My oven here in my Tokyo apartment is no where near the size and strength of my oven back in the States unfortunately. I do love to bake though. I have made pretzels before, and that was surprisingly easy!